The Merchant Cash Advance sector of the Alternative Business Finance industry exists solely for the purpose of serving business owners and entrepreneurs in need of working capital. However, not everyone operating within the industry behaves as if their clients matter more than their commissions– especially big companies that don’t have time to devote the amount of attention or level of service their applicants deserve. At Cardinal Equity, the only thing “Wall Street” about us is our zip code. 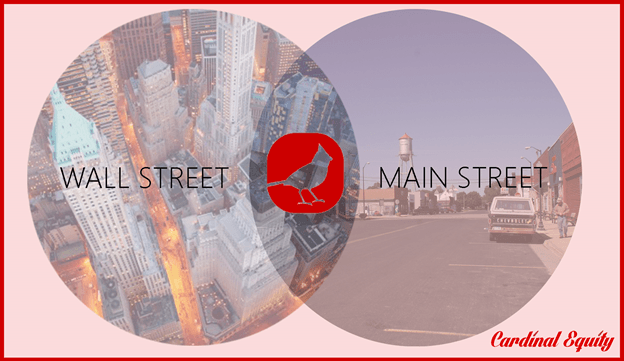 We understand Main Street’s needs, because we’re entrepreneurs just like you and we want to see you win. Business expenses pop up out of nowhere, and every business could use some extra cash for marketing, advertising, payroll, expansion, taxes, technological upgrades, new inventory… The list never ends! Cardinal Equity helps busy entrepreneurs obtain the working capital they need. Seeing businesses survive and thrive is our primary goal. We aren’t salespeople; we are service providers. We rely on our close relationships with funders rather than hefty commissions. We work with a small group of vetted individuals within the industry that ensures only the most qualified and reputable companies process your requests for capital. Cardinal Equity refuses to work with funders that knowingly overleverage companies or hound business owners. We only work with companies that are committed to treating their clients with integrity and respect. Beyond our mission to extend respect to all businesses we service, we also pride ourselves on providing the most streamlined submission and funding process possible for our clients. Busy entrepreneurs don’t have time for lengthy applications when their need for liquid capital is urgent. One of the most attractive qualities of a Merchant Cash Advance with Cardinal Equity is how little paperwork is required to apply and to be approved. …That’s it! If the four items above apply to you, you could qualify for an advance. All credit profiles are considered, and even sub-500 FICOs are approved in choice situations.